We’ll make sure you get the best price online, when you order your 1/20 oz 2018 Canadian Maple Leaf gold coin from our shop today. 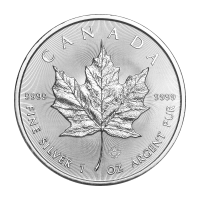 The Maple Leaf coin made it's historic debut with it's first mintage by the Royal Canadian Mint in 1979. The obverse design is more simplistic in nature, though also set on the same intricate radial lines as the reverse, it shows the queen, Elizabeth II in profile. 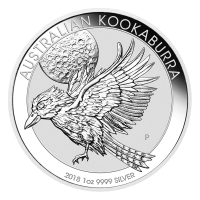 Also on the obverse is the queen’s name, the coin’s denominational value and the year of release, 2018. 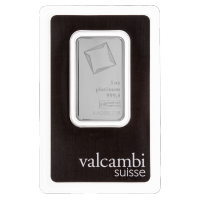 Another thing that sets this bullion coin apart is the fact that the Maple Leaf was one of the first two available on the world market, the other being South Africa’s Kruger Rand. 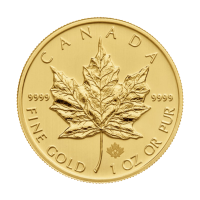 Add the startling luster of a 1/20 oz 2018 Canadian Maple leaf gold coin to your cart today and enhance your portfolio for posterity. وجه العملة تمثال للملكة اليزابيث الثانية و عبارة "Elizabeth II 1 Dollar 2018"
ظهر العملة Maple Leaf and the words "Canada 9999 Fine Gold 1/20 oz Or Pur 9999"
تمثال للملكة اليزابيث الثانية و عبارة "Elizabeth II 1 Dollar 2018"
1/20oz 2018 Canadian Maple Leaf Gold Coin We’ll make sure you get the best price online, when you order your 1/20 oz 2018 Canadian Maple Leaf gold coin from our shop today. The Maple Leaf coin made it's historic debut with it's first mintage by the Royal Canadian Mint in 1979. 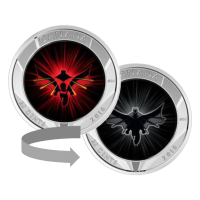 The reverse of the coin has been micro-engraved with the mint’s exclusive laser technology, to bring you a maple leaf like no other; it catches the eye with profound effect, on a field of equally awe inspiring radial lines. On the reverse you’ll also see the coin’s weight and .9999 fine gold purity, as well as the country origin, ‘Canada.’ The obverse design is more simplistic in nature, though also set on the same intricate radial lines as the reverse, it shows the queen, Elizabeth II in profile. 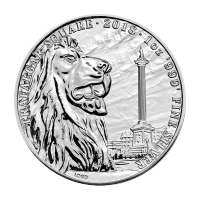 Also on the obverse is the queen’s name, the coin’s denominational value and the year of release, 2018. Another thing that sets this bullion coin apart is the fact that the Maple Leaf was one of the first two available on the world market, the other being South Africa’s Kruger Rand. 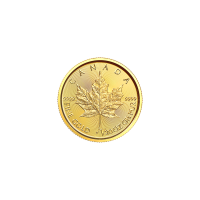 Add the startling luster of a 1/20 oz 2018 Canadian Maple leaf gold coin to your cart today and enhance your portfolio for posterity.